Sleep on a plush surface that induces a restful night sleep in your very own home by creating a bed that mimics a lavish bed in a five-star hotel. Through the use of luxurious fabrics and high-quality pillows, you'll be able to get the feeling of sleeping in a lavish hotel bed. Don't skimp on quality; though the linens may be pricy, they are well worth the money spent to give yourself some much-needed pampering in one of the places where you spend a good deal of time. Top your mattress with a soft, natural or synthetic goose-down mattress topper to add plushness to the surface of your bed. Select high-thread-count Egyptian cotton sheets; the higher the thread count, the softer the feel. Avoid using synthetic materials because they can pill, become scratchy and don't breathe well, detracting from your luxury experience. 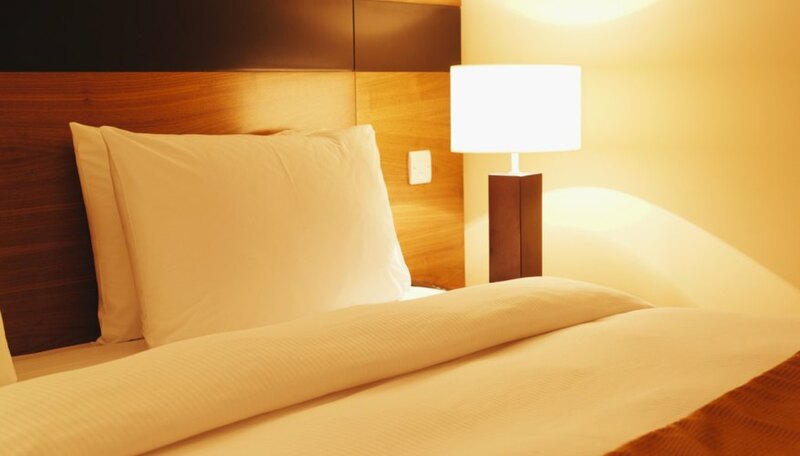 Choose white or cream-colored sheets because these are most commonly used in hotels. Smooth out the fitted sheet. Place the flat sheet on the bed and smooth it out as well. Create hospital corners in the flat sheet on the corners at the foot of the bed. Pull the remainder of the flat sheet tight and tuck it in neatly around the bed. Fold down the top 8 to 10 inches of the flat sheet near the head of the bed before tucking it in. Top the sheets with a soft, goose-down or alternative goose-down duvet placed in a decorative duvet cover made from high-quality brushed cotton. Smooth out the duvet and fold down the top 10 to 12 inches at the top of the bed. Arrange firm pillows in high-thread-count Egyptian cotton cases at the top of the bed, which will provide support while sleeping. Top the firm pillows with soft pillows, also covered with high-thread-count Egyptian cotton cases, to create a cloud-like feeling under your head as you sleep.